Self Storage is a great solution for families and businesses in need of a place to store items. We all know about the traditional form of self storage with conventional or indoor climate controlled storage units. Storage World offers great local storage solutions at our 3 Atlanta area locations. Storage World takes self storage one step further by offering a mobile storage solution, Storage World on Wheels. A mobile storage solution, for either personal or business storage, is a great idea for many reasons. For example, if you are remodeling or having restoration work done at your home, you can easily store your personal belongings in a mobile storage unit. For businesses that have seasonal sales, storing their off-season inventory in a mobile storage unit at one of our facilities and then having the container returned in time for the next season’s business can help de-clutter storage rooms. 1. 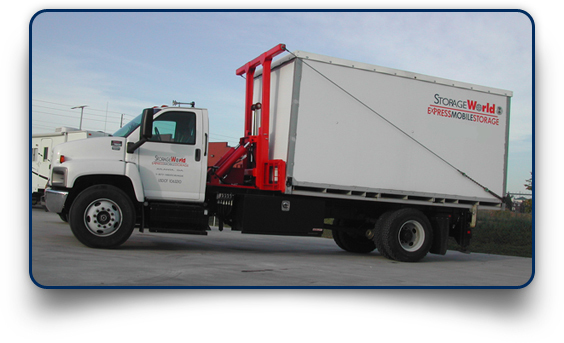 Storage World on Wheels delivers the mobile storage container to your home or business. 2. You can easily pack your belongings in the container. 3. Storage World on Wheels will pick up the container when you are ready and store it at one of our 3 locations or move the container wherever you would need us to take it. The storage containers are placed on ground level, which allows for easy access to the unit when it is being packed. Once the container is ready for pick-up, Storage World on Wheel’s horizontal lift trucks gently lifts the containers on the truck. The storage containers can be moved to one of our 3 storage locations in Decatur, Stockbridge or Jonesboro or taken to your new home within our service area. If you are storing your container at one of our locations, you can access your stored items during our regular gate hours of 6am to 10pm-7 days a week using your digital gate code. Your container will have your lock and you will not have to make a reservation to access your storage unit. Getting a quote for mobile storage is very easy and can be completed in 3 easy steps online or you can call or stop in to our 3 locations for more information. Using mobile storage is easy to do and a very smart way to store.